It was pleasing to see that international footy received some recognition in the Australian Football League's season review. Although small, it is another small step as the game's growth around the world receives more attention. In line with its Strategic Plan the AFL accepts responsibility for international development. The presence of Australian football in international markets continues to expand in size and organisation. The AFL works closely with the 11 international affiliates and their participation rates are increasing. The AFL International Development Committee meets regularly to monitor progress and identify new initiatives to support further growth. The Committee comprises David Matthews (General Manager, AFL Game Development - chairman); Ed Biggs, (Community Development Manager AFL – convenor); Marty Alsford (independent); Brian Dixon (independent); Trevor Wright (British Australian Rules Football League – Europe region); Mark Wheeler (United States Australian Football League – Americas region); Troy Beard (Japan Australian Football Association – Asia/Africa region); Bernie Woodland (Samoa Australian Rules Football Association – Paciic region). Two highlights on the international scene in 2004 included Essendon coach Kevin Sheedy’s attendance at the USAFL Championships in Atlanta and St Kilda’s visit to South Africa, which has stimulated further interest in a rapidly expanding region. 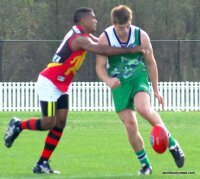 In August 2005 the second AFL International Cup will be held in Melbourne.